The Stardust Next spacecraft as approached within 110 miles of the comet Tempel 1. "The crater partly healed itself"
(CNN) -- To the untrained eye, the images from 200 million miles away don't look much like a crater. But scientists say it's there, no question about it. "We can see it in multiple images so I feel very confident that we actually did find the site," NASA co-investigator Pete Schultz said during a news conference at the Jet Propulsion Laboratory in California. The images sent back over the course of Tuesday were taken by the Stardust Next spacecraft as it approached within 110 miles of the comet Tempel 1. It was billed as the Valentine's Day rendezvous as Stardust came closer and closer to the comet throughout Monday. The hope was that Stardust would send back dramatic pictures of a hole in the comet made by another spacecraft back in 2005. During that mission, called Deep Impact, a probe was sent crashing into the surface of Tempel 1 to get a close-up look at the material below the surface. However, the force of that collision threw out so much debris that it obscured from view the resulting crater. 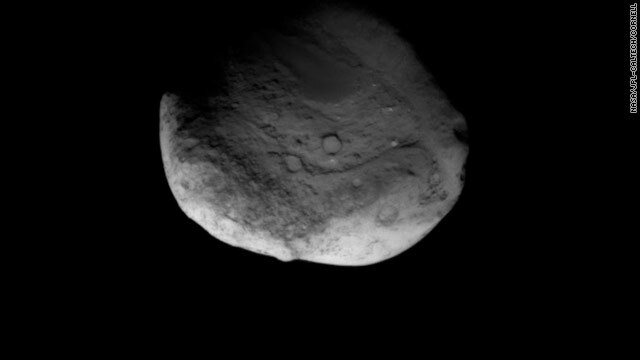 The Stardust images showed spectacular close-ups of the boulder-shaped comet and highlighted how erosion has changed the face of Tempel 1 over the past 5½ years. But the images did not show much of a crater. The scientists say they believe the debris blown into air settled right back down. "The crater partly healed itself," Schultz said. At one point he joked, "Hey, we saw the crater." Principal investigator Joe Veverka added, "Yah, we really did see the crater." Despite less than jaw-dropping images of a giant hole, the fly-by has given the science team a lot to study. This was the first time a comet has been visited twice. Scientists believe the images will lead to a greater understanding of a comet's composition and how they formed 4.5 billion years ago. For the Stardust spacecraft, this was its second life. Launched in 1999, its first mission was to fly by an asteroid and then on to the Comet Wild-2, where it flew through the dust cloud and literally captured material from the cloud. That material was sent back to Earth in a return capsule. With lots of fuel to spare, NASA decided to fund this additional mission and dubbed it Stardust Next. The spacecraft will continue sending back images of Tempel 1 as it pulls away from the comet.